Israel's cabinet has approved punitive sanctions on the Palestinian Authority, now dominated by militant group Hamas. Israel will withhold an estimated $50m (£28m) in monthly customs revenues due to the PA, as well as impose travel restrictions on Hamas members. Acting Prime Minister Ehud Olmert said the PA was becoming a "terrorist authority" and ruled out any contact with a Hamas-led government. 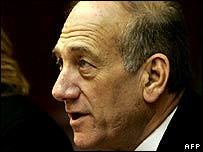 Israel would allow humanitarian aid to reach the Palestinians, Mr Olmert said. The cabinet did not adopt harsher measures proposed by security officials, in apparent deference to US calls to avoid increasing hardships for ordinary Palestinians. Mr Olmert said Israel was not prepared to work with a Palestinian Authority (PA) in the hands of Hamas. "It is clear that in light of the Hamas majority in the PLC [Palestinian Legislative Council] and the instructions to form a new government that were given to the head of Hamas, the PA is - in practice - becoming a terrorist authority," Mr Olmert said. "Israel will not hold contacts with the administration in which Hamas plays any part - small, large or permanent." Russia invites Hamas to Moscow for talks aimed at helping the stalled peace process, stressing Russia's opposition to terrorism but its willingness to talk with the organisation's political wing. European Union foreign policy chief Javier Solana says Israel should not have acted before Hamas forms a government or sets out a policy towards Israel. Speaking to the BBC, Israeli foreign ministry spokesman Mark Regev said Israel would ask foreign governments to back its position on the new PA.
"The logic is clear: with a terrorist group now in charge of the Palestinian treasury, no-one can assure Israel that we won't see these funds come back to haunt us in the form of suicide bombers." Non-governmental organisations working in the Palestinian territories were likely to see Israel increase its backing for their work, Mr Regev added. As well as withholding tax payments, the cabinet also ordered increased security checks at crossings between Israel and the Gaza Strip, a ban on the transfer of equipment to Palestinian security forces and a tightening of restrictions on the movement of Hamas officials. Hamas has carried out nearly 60 suicide bombings and hundreds of armed attacks against Israelis in recent years. The militant group has so far rejected demands that it recognise Israel and renounce violence, but it has been observing an informal truce with Israel. The newly-elected speaker of the Palestinian parliament, Hamas-legislator Aziz al-Duwaik, said Israel's new measures would prove counter-productive. "This is a faulty decision, and the Israelis must reconsider their decision. It will only increase hatred." 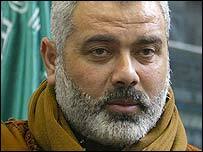 Palestinian leader Mahmoud Abbas is expected to ask Ismail Haniya of Hamas to form a government, after his widely-anticipated nomination was confirmed on Sunday. A day earlier, at the inauguration of the new Palestinian parliament, Mr Abbas stressed the need for a negotiated settlement with Israel. Seventy-four Hamas members were among those sworn in to the PLC at ceremonies in Ramallah and Gaza City. Also on Sunday, Israeli aircraft killed two Palestinians suspected of laying bombs near the border with Gaza. The men, hit by a missile near the border fence at Kouza, were reported to be members of the Popular Resistance Committees, which has carried out previous attacks against Israeli targets.